Will Tuesday’s elections continue Colorado trend line written in Democratic “blue ink”? Briana Ross and Lisa MacCarty don’t have much in common. Ross is a Republican. MacCarty is a Democrat. Ross is a stay-at-home mom of four who lives in Elbert County. MacCarty is a working professional in Westminster. Ross is white. MacCarty is biracial. Two things they do share: Both moved to Colorado for a better life. And this fall, both have volunteered for the political candidates and groups they believe will deliver the Colorado they want. For Ross, who left California with her husband in 1994, it’s a low-tax, small-government state. “We just want to live a simple life and for government to interfere as little as possible,” said Ross, who supports Republican Walker Stapleton for governor. For MacCarty, who left Texas with her fiancé in 2017, it’s an inclusive state where everyone helps pay for the common good. “We understand that taxes have to happen, and so long as it’s going for something good, I’m willing to pay more,” said MacCarty, who is supporting Democrat Jared Polis. Each woman symbolizes the different paths Colorado voters could put the state on following Tuesday’s elections, where contentious battles between candidates for numerous offices await sorting out, as does a long list of ballot issues dealing with the economy, education, taxes, public health and the environment. All in all, politics watchers in Colorado seem to agree that 2018 will be a more auspicious year for Democrats, in part because of the gains the party not affiliated with the president typically makes in midterm elections. Add in the combustible mix that President Donald Trump brings to the table, and talk of a national backlash against the anti-establishment president is never far from the electoral conversation. But independent political analyst Eric Sondermann said Democratic fortunes in the Centennial State in 2018 and beyond are more deeply rooted than what the vagaries of this election cycle suggest. Pollster Floyd Ciruli points to the advantage Democrats have amassed over Republicans in voter registration in the last decade and a half as a sign that Colorado’s shifting demographics — a change largely fueled by the in-migration of urban-minded millennials — are beginning to have a profound impact on the state’s political sensitivities. Whereas in 2004, Republicans had 1.1 million registered voters to the Democrats’ 940,000-plus, the Colorado Secretary of State’s Office shows Democrats now have a 1,007,948 to 979,204 edge over the GOP in registered voters as of Oct. 1. Not only could that end Republican dominance in the state Senate, it could mean a solid blue reign in the legislature and in the governor’s mansion — the first time the Democrats would have control of those three levels of government in Colorado since 2014. 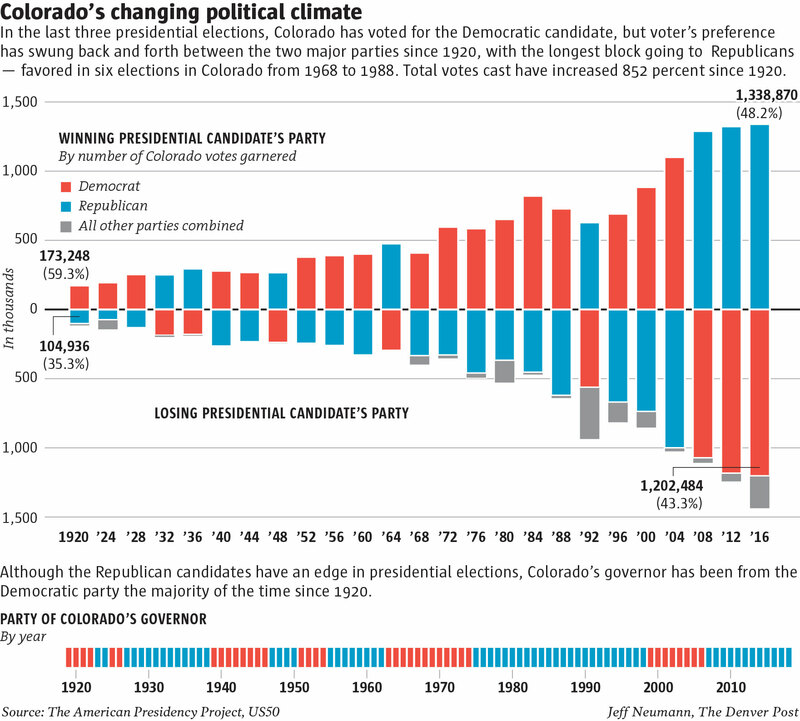 Republicans haven’t enjoyed that power dynamic in Colorado since 2004. It could also mean more receptivity to tax issues on this week’s ballot, including a $6 billion sales tax hike to fund transportation improvements and a $1.6 billion tax increase for education funding. A bluer Colorado could also put some wind at the back of Proposition 112, which aims to increase the distance that new oil and gas wells must be from occupied buildings and waterways in the name of protecting public health. But Kelly Maher, executive director of Compass Colorado, a political nonprofit that advocates for conservative causes, said a vote for greater oil and gas setbacks in Colorado is in no way in the bag. Of those moving to the state, she said, many come from places such as Texas, where energy operators have long been pumping black gold. And even those with little knowledge about the technical intricacies of hydraulic fracturing understand the critical role a burgeoning energy sector means to the state’s economic health and the nation’s energy independence. “Just because they didn’t grow up here doesn’t mean they don’t understand the complexity of our economy,” Maher said. She acknowledged that tax increases are an easier sell when the economy is doing well, and Amendment 73, which seeks $1.6 billion for Colorado’s schools, has an added advantage in that it places the onus on the wealthy and on businesses to pay its costs. But she noted that just five years ago, voters overwhelmingly defeated a nearly $1 billion statewide school funding measure. Maher said it will just be a matter of time — especially if Democrats take control of both legislative chambers and the governor’s office — before the party overplays its hand and infuriates voters. A classic example of voter pushback occurred in 2013 when Democrats, in control of the governor’s mansion and the state legislature, passed gun control lawsthat prompted the unseating of two Democratic state senators in a pair of unprecedented recall elections. “The question is not whether they are going to overreach — but how much they’re going to overreach,” Maher said. “Both the party and the political makeup here are shifting to progressive values in a way that’s new for Colorado,” she said. Much of that can be pegged to a growing urban and suburban electorate along the Front Range — one that has more young and Latino voters than ever before, topped off by an energized base of female voters reinvigorated by the #MeToo movement. Sondermann said that with Colorado’s large swath of unaffiliated voters holding ultimate control over what happens at the ballot box, the electorate will continue to swing the pendulum in the opposite direction when things get too lopsided, keeping Colorado a swing state for the foreseeable future. But the blue hue in the state’s body politic is getting slightly darker with each passing election cycle as Colorado continues to urbanize and diversify, he said.